Many thanks to Al, from Philadelphia, USA, for sending us these shots from Vietnam. "I love the blog and I was looking forward to having a chance to send these to you. 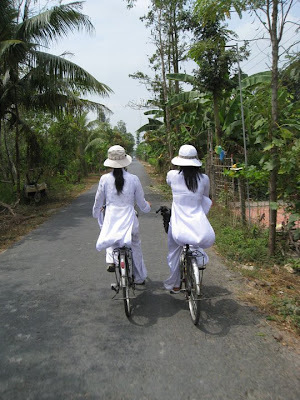 My wife and I recently returned from a trip to Vietnam, including a bike tour around the Mekong Delta. Although much of the country's transportation has converted from bikes to scooters (25million scooters and counting), there is still some great cycle culture. 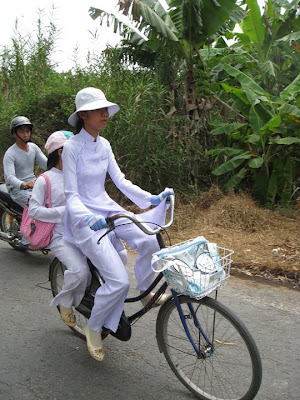 The school kids mostly bike home from school and, as I understand it, adolescent girls often have these fantastic white silk school uniforms (younger girls do not, and not all schools seemed to require this outfit) and they are a vision. The girls in these pictures were within a few hundred yards of the road turning to dirt and I presume they were just going to continue on their way -white silk clothes on dirt roads... Two of these girls are also demonstrating a common way of riding with a friend -just sit on the rack and many of the rack-riders help pedal by placing their feet on the outermost edges of the pedals. We'll do the thanking, Al! Thanks for these lovely shots. duuude! love it! viet nam is beautiful. went here this last summer. delightful bike culture!